It's some interesting topic! : Why a world religion? And in 20 languages? Why a world religion? And in 20 languages? In a blog entry I've explained why I consider running a religion and why I want to spread this religion with social media. Still, what's the point with doing it worldwide? Isn't enough to do it close to my own front door, either at home in Munich, Germany or in my native Finland? The reason relates to my interest for other countries, cultures and languages. Through my work, I've travelled a lot especially last year, as Ambassador of the product of my former employer. As I got the assignment, I had decided for the duration of my ambassadorial travels to give the first five minutes of my presentation in (one of) the local language(s). And that's what I ended up doing. It all started with Italian; of all languages that I don't speak, I speak Italian the best. Thereafter I presented in Japanese (Swedish sounds, Finnish Staccato). And after I could make myself reasonably understood by an audience in Chinese, I lost the respect for the difficulty of other languages; since then, I've added Russian, Turkish, Spanish, Portuguese, Czech, Estonian, Latvian und Lithuanian to the list. My respect for the value of other languages, on the contrary, grew immensely. The world doesn't become a better place through everyone speaking Bad English with each other. Clearly, additional languages also represent an extra cost. I cannot present all aspects of Runnism in all languages. Hence I will mostly use the languages that I know best and that I have the most contact with. On that list, Swedish comes first, as my native language and connector to relatives, friends and acquaintances in Finland (and Sweden). On second place, there's German, as I live in Munich since three years and have a German wife (since 17 years). On third place, there's English, as a lingua franca for all friends and acquaintance that neither understand Swedish nor German. As a next step I contemplated what Runnism should be called in other languages. I concentrated on languages of European origin, and added Chinese (蘭主义) and Japanese (ラニズム) for good measure and for global credibility. I ended up with a list of twenty languages, in which I might write a tweet or two. When translating Runnism I used the analogy to Buddhism. 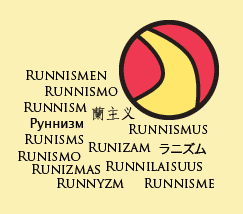 For example, Runnism is called Runnilaisuus in Finnish (analogously to Buddhalaisuus), Runizam in Croat (Budizam), Руннизм in Russian (Буддизм), Runnismo in Italian (Buddhismo) and Runizmas in Lithuanian (Budizmas). Hence: A world religion, since running is good for all of us and since running connects us beyond the borders of countries and languages. And twenty languages, as I see it as a sign of respect to use the language of one's counterpart. In spanish there are 2 verbs that have the meaning of "running"
Feel free to choose one. @EdwinF Thanks for your great suggestion! So far, I've used "Run*" in all languages, although I know of no other language where running starts with Run. That's for the "recognition effect". But you do have a point -- and I would probably have picked Correrismo for Spanish, if I had gone with "complete" translation. Runnism, the Religion of Running -- why?